Every day, Watch This offers staff recommendations inspired by a new movie coming out that week. This week: The Scarlett Johansson vehicle Lucy is the latest action-packed import from EuropaCorp. For the next five days, we highlight some of the French studio’s finest offerings—including a few without gunfights and car chases. American cinephiles probably know EuropaCorp—the company that exports action movies—by its studio head, Frenchman Luc Besson, and his various protégés, associates, and hangers-on. Most of these films are pretty forgettable, though once in a while the Besson assembly line produces some top-tier junk food, like the delightful Transporter trilogy that will serve as an eternal line of credit for Jason Statham, or the exciting and surprisingly affecting Unleashed, with Jet Li. But EuropaCorp also sometimes helps to finance films that don’t feature a single Expendable. American studios and distributors were not particularly interested in I Love You Phillip Morris, despite the presence of superstar Jim Carrey, due to its explicit (if lighthearted) treatment of homosexuality. And so EuropaCorp stepped in and helped get it made. After some shelf time, the film eventually received a limited U.S. release, but it remains by far the least-seen leading performance of Carrey’s career. It’s also, easily, one of his very best. The actor plays real-life con man Steven Russell who, in the movie’s whirlwind opening section, revels in his happy marriage to Debbie (Leslie Mann) and his job as a cop, tracks down his long-lost biological mother, gets into a terrible car crash, and comes out of the closet. This is the kind of event compression that can easily cause whiplash, but writer-directors Glenn Ficarra and John Requa (who wrote but didn’t direct Bad Santa, then directed but didn’t write Crazy, Stupid, Love) display such a strong command of the movie’s semi-satirical but humane tone that the nuttiness is as graceful as Carrey himself. The actor fuses his manic physical chops and serious empathy in a manner that most of his broad comedies never required. In its tricky way, this one is a broad comedy, too; it’s just smarter and weirder than Carrey’s usual output. 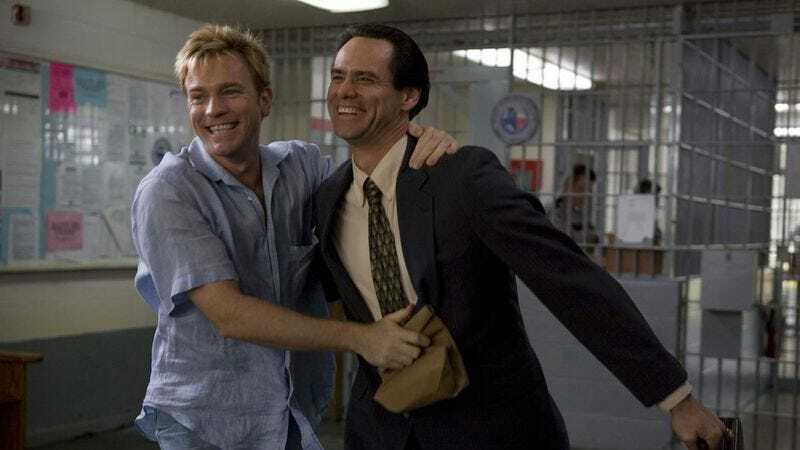 The story only gets less traditional as Russell turns to con jobs big and small, eventually landing in prison, where he falls in love with the gentle Phillip Morris (Ewan McGregor). Russell’s feelings (and repeated reprimands) don’t dissuade him from building his life—really, a series of lives—around his elaborate cons, just as Russell’s real-life rap sheet doesn’t dissuade Ficarra, Requa, and Carrey from having a blast toying with their characters and even the audience. The movie turns conning into an act of deranged passion. EuropaCorp has made a lot of money in the action genre, but I Love You Phillip Morris turns out to be one of their most thrilling films. Availability: I Love You Phillip Morris is available on Blu-ray and DVD, which can be obtained from Netflix, and to rent or purchase through the major digital services.